Jesús Pérez Díaz is an Electrical Engineer born and raised in Venezuela, specialized in Power System and experienced as Project Engineer for Oil&Gas industry. Also focused on Electrical Protection, design and operation of Power systems, he naturally wrote for us an article about electrical generator protection. Enjoy! And remember, if you want your article to be published in the blog, reach us by mail. 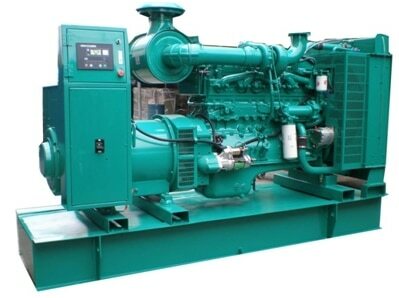 Since Generators are rotatory machines and in addition are composed by many parts (Stator winding, Rotor winding, Exciter, Bearings, among others) they are more prone to fail than any other equipment in the power system. Generators can be affected due to electrical faults (Overload, Phase/ground fault, Overvoltage, Unbalanced current, Subsynchronous oscillation, Motoring, etc.) and also mechanical troubles (Vibrations, Overspeed, Underspeed, Overheating, etc.). These may be associated to a proper generator condition (Internal fail) but also to disturbances that may occur in the Grid to which generator is connected (External fault). After all of this, it is noted that the protection of the electrical generator should have special attention, so this article focuses on different Electrical Protection Schemes that may be used for Synchronous Generator, remember that each case needs special study to conclude if the selected protection philosophy is adequate, so this only serves as guide. The first one is called “3S”: Selectivity (fault must be cleared by the correct device), Speed (as fast as possible), Security (high reliability). The second one aims to keep equilibrium between technical requirements and costs, being simple but maintaining the needed reliability in the power system. Because of the low power rating, a simple protection scheme could be used, take a look to figure 1. Time overcurrent relays (51/51N) protect the generator from damage because of Short-circuits (Phase and Ground). In the same way, a thermal relay keeps it away from Overload damages. Important to realize that relay curves must be fixed to trip before generator damage curve. 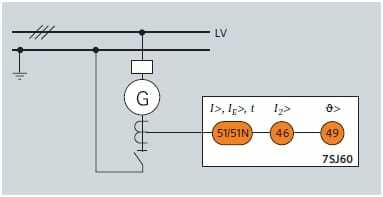 Note that these protection functions (51, 51N, 49) in low voltage can be implemented by LSIG and thermal-magnetic trip units, using MCCB or LVPCB. Additionally, a negative sequence (46) relay is added to detect any phases unbalance. The above scheme can be improved adding a Core Balance Current Transformer and a ground fault relay (51G). These ones are more expensive and may be used to supply an entire facility (small industry, hospital, etc.) working in parallel with other generators or the normal energy source. Hence they need a better protection system. See figure 2. Sudden frequency changes and power oscilations can affect the power system stability, consequently this scheme implies more protection functions which are intended to avoid these conditions. 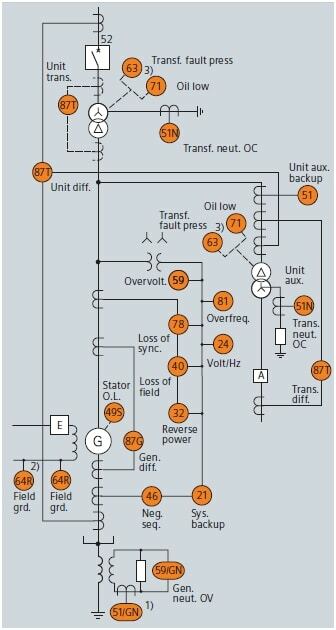 Frequency (81) relay detects variation of the voltage frequency (frequencys is directly associated to the speed), Directional power relay (32) detects generator motoring condition (motoring condition can create Power Oscilations in power system), Overvoltage relay (59) is intended to detect voltage increases in the generator or connected network (Overvoltage is associated to sudden load shedding and exciter fails). In this category, more attention need to be paid since auxiliary elements are more complex and any damage could be serious and expensive to repair. Look at figure 3. As can be seen, a Rotor earth fault relay (64R) is added in the rotor winding (field) to detect any internal ground fault (rotor winding can be affected by vibrations and thermal streeses that may produce ground faults). 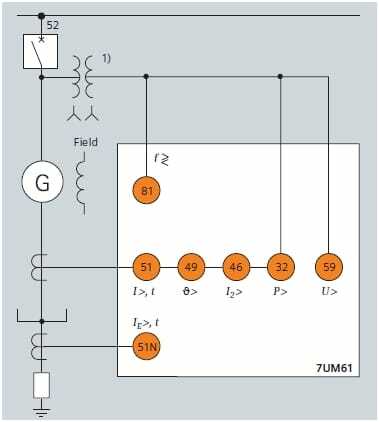 Also, a differential relay is considered (87), it compares the current at the two ends of the generator, any difference between them (a % is tolerable) is because of an internal fault (it is totally selective); 87N has the same philosophy but involving ground. 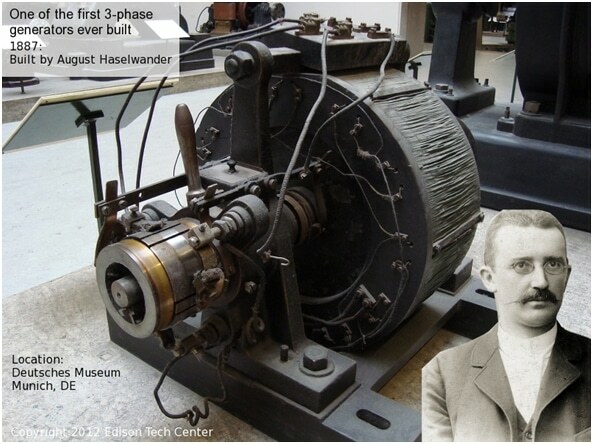 Loss of field excitation can make the generator to operate as an induction machine (It is not designed for it!) and reactive power will flow into the generator, hence a loss of field relay (40) is applied to supervise the excitation system. These ones are usually applied to feed large facilities or as distributed generation sets in utility companies. Take a look figure 4. More relays are added, but almost all are already explained, however I would like to highlight that this scheme considers redundant protection. “Don’t put all your eggs in one basket” is also applicable in protection systems, what happens if for any reason a relay does not operate, so there is other one with same features ready to operate! (You’d better have it). Now, we are talking about Large Generators which are more expensive and for sure have more importance in power systems. 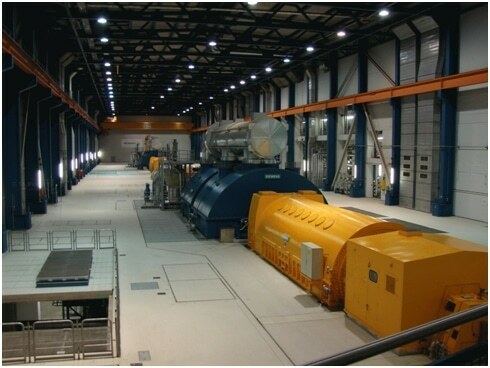 Large generators are present in Generating Stations and serve industrial, commercial and residential loads. They are connected to a Grid, so there are many other generators operating in parallel, therefore a better and a sophisticated protection system is needed in order to protect the power system. See figure 5. Yes you are right! It is harder to analyze this scheme but note that almost all protection functions used for 5-10 MW generators are present here; additionally the redundant protection must be taken into account (although figure does not show it). These kinds of generators are usually connected to a Step-up Power Transformer which increases the voltage to transport all the power by high voltage lines. Also a transformer to feed the auxiliary services of the power station is considered. Both transformers have their proper protection devices (87T, 63, 51N1 71). One of the protection added in this scheme, takes into account the interface between the generator and the transformers. 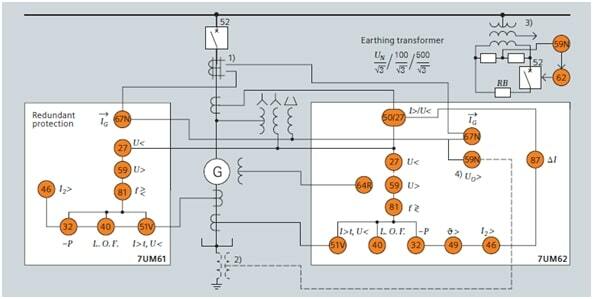 It is the 87 (differential protection), which senses the current sum of the generator and each transformer to detect any fault located in the internal zone. 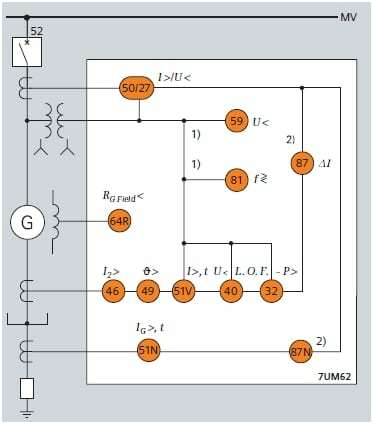 IEEE Std 242. IEEE Recommended Practice for Protection and Coordination of Industrial and Commercial Power systems. Thank you for this material Jesús! Did you all find it helpful? Do you have questions? Let’s tell him below! or copy this trackback: http://engineering.electrical-equipment.org/electrical-distribution/electrical-generator-protection.html/trackback from your own site. Thanks for sharings good information. Te hago unos comentarios al respecto de los pequeños generadores, y siendo que en la práctica reconocidos fabricantes (Caterpillar, Waukesha, Guascor, John Deere, provistos de alternadores franceses tipo Leroy-Somer) equipan este tipo de máquinas sincrónicas (Gen-sets) con protecciones estandard tipo MCCB, siendo que los niveles posibles de corriente de cortocircuito que pueden aparecer en bornes del generador y aguas abajo no llegan a ubicarse dentro del rango del poder de corte de este tipo de protecciones (fuera de rango en tabla de la protección); sino muy por debajo (aproximadamente 3In), cómo considerás que actúan, y por lo tanto se deben proteger estas instalaciones frente a la ocurrencia de este tipo de falla? Gracias. Gastón!, que tal gracias por tus palabras, me alegra que te haya gustado mi articulo, además es un placer para mi compartir con colegas de todas partes del mundo. -Nivel de Cortocircuito: El nivel de cortocircuito es lo suficientemente bajo como para que un MCCB pueda operar sin resultar dañado. -Confiabilidad: La confiabilidad requerida para el generador no amerita el uso de Relé de protección. Recordemos que los Relés numéricos poseen funciones de contro y monitoreo que añaden gran valor al sistema debido a que se puede tener total supervisión remota del generador. -Protección del generador: La curva de disparo del MCCB debe estar por debajo de la curva de daño del generador. Con relación a las fallas a tierra (Creo que es a lo que te refieres con 3in), usualmente estos interruptores poseen unidad de disparo con modulo de tierra (lsiG o lsG o liG), de tal manera que pueden tener ajustes desde el 5% (por decir un número) del rating del interruptor, dando protección contra fallas a tierras.